The career of artist Jack Knox spans over 5 decades. He studied at Glasgow School of Art and the Andre L'hote Atelier, Paris, winning a string of prizes including the Carnegie Trust Travelling Scholarship, the Guthrie Award, several RSA awards, and the Scottish Arts Council Award. Knox, a 'Glasgow Boy' of the 1950s era, became a Senior Lecturer in Drawing and Painting at Duncan of Jordanstone College of Art, Dundee where he taught for 16 years. He became Head of Painting at Glasgow School of Art in 1981 till 1992. Knox is an excellent example of an accomplished and committed artist who has managed to bridge the proverbial 'generation gap' at each successful stage of his career. He has been able to do this through his continuing interest and enthusiastic involvement of the interests and affairs of his colleagues, teaching staff and contemporaries, both at home and in the wider field of the changing Art Movement in Europe and America. He has inspired and influenced generations of new artists graduating under his watch, many of whom now have successful careers with international status. Amongst them, to name a few, are Jenny Saville, Alison Watt, Steven Campbell, Adrian Wiszniewski, Ken Currie and Stephen Conroy. Knox has had numerous solo exhibitions throughout the UK and further afield. His group exhibitions include Chicago, Warsaw, Brussels, New York, Dusseldorf, Vienna, Sao Paolo and Sarajevo. A regular exhibitor in the New Charing Cross Gallery, Glasgow, he has continued to exhibit at Compass Gallery and Cyril Gerber Fine Art since their inception. Works in public collections include Aberdeen, Dundee, Edinburgh, Kirkcaldy, Glasgow, Manchester, Sao Paolo, Los Angeles and many others. 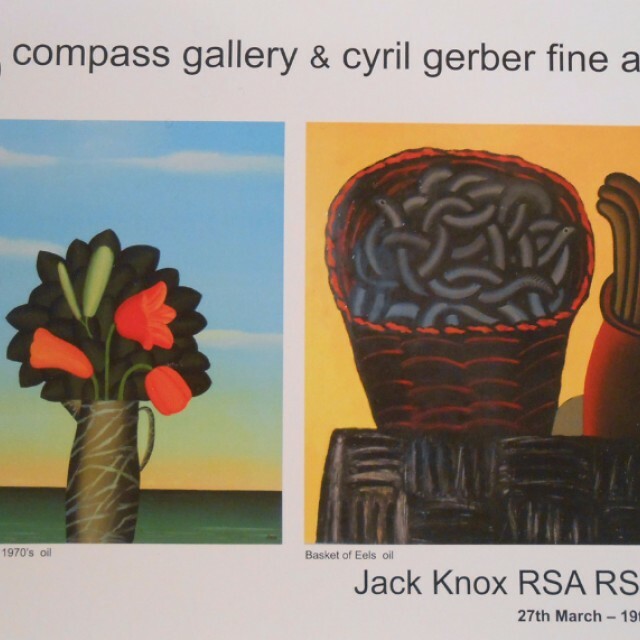 This exhibition from the 1950's to present day celebrates our long association with Jack Knox and includes works from the 1950's to present day.